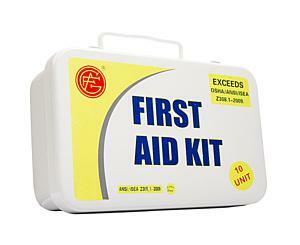 Metal First Aid Kit for 10 persons with essential first aid items per ANSI 2009 specifications. Contents are organized via the Easy Access Pocket System which is the patented system that makes your First Aid Kits much faster and easier to use - which is vital in an emergency when you don't have the time to go through everything in your kit. In case of an accident or emergecny requiring first aid, you simply open your kit, fold out the clearly labeled pockets and at a glance you choose and open the one you need in the emergency at hand.